SW20 Cottenham Park Office & Domestic Rubbish Removals | RDA Cleaning & Maintenance Ltd.
Are you looking for residential and commercial rubbish removals service? 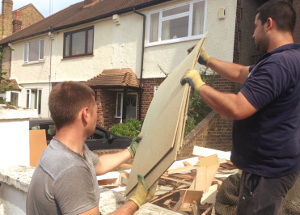 Then, you need our professional rubbish removal Cottenham Park SW20 company by your side. RDA Cleaning & Maintenance Ltd. is the right choice! Do not hesitate and rely on us today. Contact our professional rubbish removals customer support representatives right away! Use this phone number: 020 3404 1646 to get more detailed information or to arrange your service. Note that we are available for emergency services and same-day reservations, too! Re-scheduling is possible and 100% free within a reasonable time. RDA Cleaning & Maintenance Ltd. is a well-known professional waste collection Cottenham Park SW20 company. We know and always apply the most optimal formula for disposal wasting in your home or in your office space. The experienced technicians are trained to handle each individual case with a personal approach. Once they check out the junk you want to deal with it quickly, they will make you an offer. Only after decent negotiations about the correct date, the final price depending on the junk size, the transportation route and the details for the packing, the contract is signed. Note that you do not have to provide us any bags, cardboard or other packing materials. We only need some parking space to leave the van with all the necessary materials we will bring. All of our workers are insured, trained and professional. Our professional rubbish collection Cottenham Park SW20 services combined with the experience are one of the fastest and safest ways of getting rid of that rubbish that has been piling for a while. The company collects all types of rubbish. The first thing we do is sending a team which will evaluate the volume and weight of the things that have to remove. They will tell the resident the price that the service will cost. the customer. If they agree on it than our vetted workers can begin straight away. After everything is gathered they will then transport it to the nearest dumpsters or recycle area. For the purpose of being efficient to the maximum one, a team will use one dumpster or recycling area. Our hassle-free rubbish removal service is performed by specially educated, trained and prepared technicians. They are all vetted and fully insured. Don`t hesitate to ask for an advice or discuss the waste disposal in Cottenham Park SW20 with our polite removal operators till they find the best solution for you. It`s their job. Note that the service is at first quoted, because neither the price, nor the duration is fixed. The rubbish removal specialists at first examine the property - loft, garage, apartment, house, basement, commercial IT or Tyre building, warehouse and etc - to see its size and to check the volume and the type of the rubbish. Last, but important thing, keep in mind that we deal with any junk - excluding hazardous, medical or building materials and products. So, if you wish to hire a professional rubbish removal Cottenham Park SW20 company that will do their job with the fastest of means and no hassle, then, by all means, please give us a call at 020 3404 1646 or use our online booking form and we will be straight on the way to your location. Lern more about our rubbish removal deals and get a free quote! The nearest tube station serving SW20 Cottenham Park is Morden.